This morning I am presenting at the Spring 2018 Multifamily NW Apartment Report event. The big picture takeaway from the Portland rental market is something like the following. The continued supply of new apartments is beginning to result in a rising vacancy rate, and the flattening of rents. In fact 7 of the 20 submarkets covered in the report saw rents decline. For renters and the overall economy, this is a welcome respite from the affordability problems in the past decade. When coupled with ongoing household income gains, it means housing affordability is set to improve in the coming years. However, this market reality, when combined with rising interest rates and slowing economic growth, is potentially a cause for concern for some developers, lenders, and property owners. It depends upon the financing and assumptions upon which their projects were built, or in some cases still being built. There is likely to be some near-term adjustments, or even financial pain, particularly for the buildings still being built and for some of the apartments built this cycle as they begin to come due for refinancing. These trends and issues are always part of the development cycle, and it looks like we are now there. 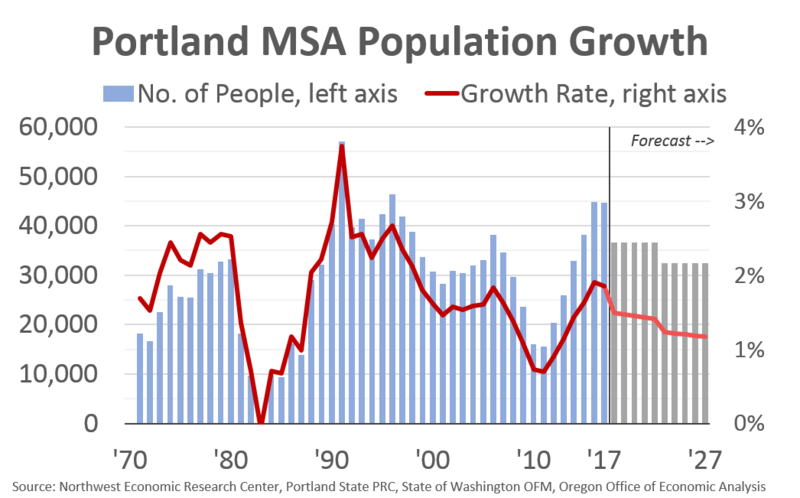 With this backdrop, my brief remarks touch on Portland’s transformational growth in the past decade, but primarily focus on medium- and long-run expectations for population growth. This catch-up in the supply of new apartments is beneficial in the near-term sense as it helps with affordability, and over the coming years it also means there will be units for new residents to move into. Here in Oregon, one of our key comparative advantages is our ability to attract and retain, young, skilled households. While this is a huge boon to the regional economy, it also means population growth is our biggest risk to the outlook. Should migration dry up for any reason — be it a poor economy, or the lack of housing affordability — our longer-run forecasts would be revised lower. Given the fact that the natural increase of population will turn negative in a decade, we are even more reliant upon migration than in decades past. For now, the expectation is for a continued influx of new residents each year. As the economy transitions down to more sustainable rates of growth overall, so too will population gains. While the immediate future will most likely show more apartments delivered than can be immediately filled with residents, over the medium term this does not appear to be much of a concern. 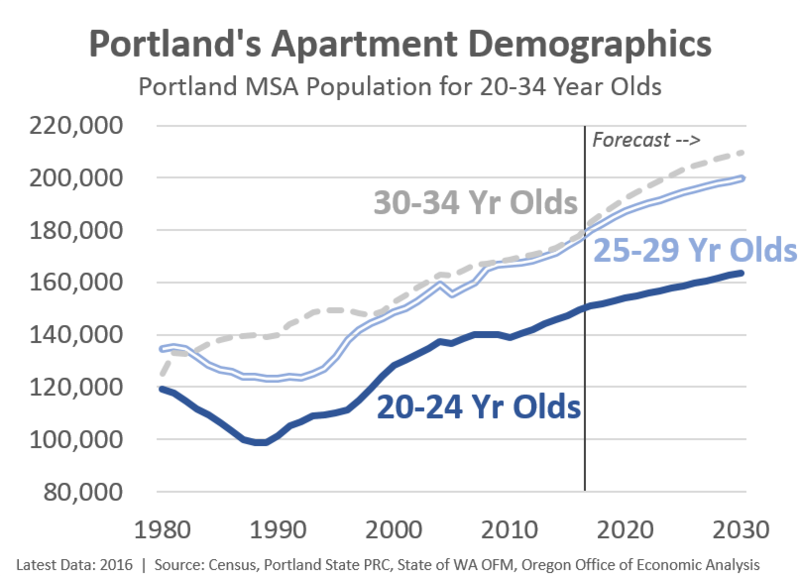 Population forecasts expect that over the next 5 years, the Portland region will welcome nearly 6,000 new residents each year between the ages of 20 and 34 years old, the core apartment demographics. Households in their early- and mid-20s rent about 80% of the time. Gains the following 5 years will be slower, but still a bit more than 4,000 new residents in this demographic. Keep in mind by new residents I mean overall increases in this age group. It is a combination of migrants moving to the area, but also current residents aging into and out of different age groups. When you take a look at projections for household formation across all age groups, it shows that the Portland area is expected to see healthy gains in the coming years. These projections are based on the population forecasts and the current rates of household formation and homeownership by age group. 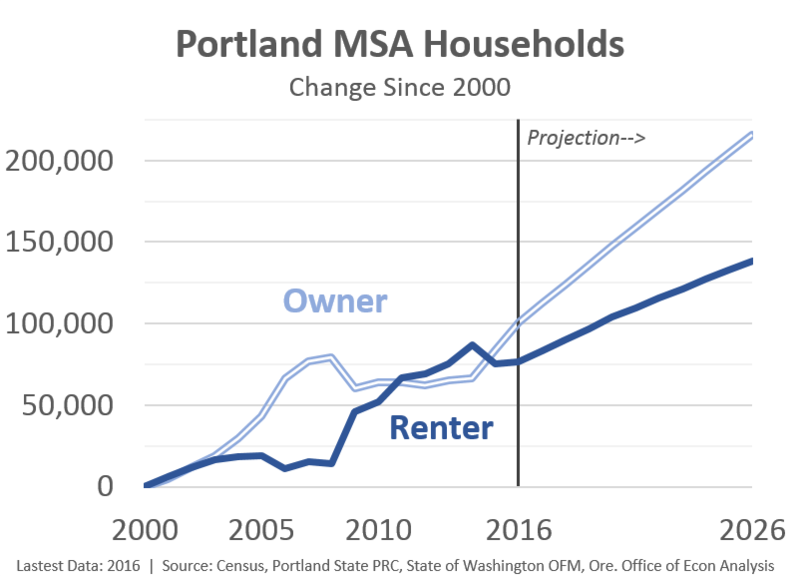 Given this, the majority of the household gains are expected to be owners now that we are past Peak Renter. Household finances and demographics are working in favor of ownership in recent years. That said, the biggest takeaway from this work is that there will be enough households in the future. Lack of housing demand is not the issue. The challenge is that the region will need to build considerably more than it already has if these population forecasts are reasonably accurate. In terms of thinking about the risks to these projections, three stand out. First would be the business cycle. We know migration slows during recessions and people hunker down and move less. Given expectations already are for slowing population gains, a recession scenario relative to the baseline would show household increases that are maybe 10% less than baseline over the next 5 years, and a smaller decline over 10 years. Somewhat similarly would be the second risk of not building enough housing overall. This scenario would result in worsening affordability which would slow or even choke off population growth, proving these projections optimistic. This scenario would also lead to more displacement as only higher-income households could afford to move to the region. The third big risk to these projections is the owner-renter split itself. As mentioned above, it is based on the current market, and current homeownership rates by age group. If the region does not build enough ownership product, then more households will continue to be renters even they have the resources and desire to be owners.